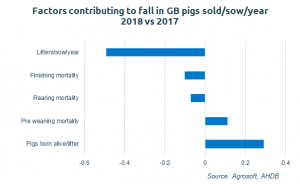 GB breeding herd productivity declined in 2018, according to the latest physical performance data, provided to AHDB by Agrosoft, This was the first year performance has not improved since 2010. The average number of pigs sold per sow per year fell from 24.09 in 2017 to 23.84 in 2018. This was largely due to a fall in the number of litters per sow per year, from 2.3 to 2.2. The overall decline was driven by the outdoor breeding herd. The number of pigs weaned per sow fell from 22.41 to 21.57 (-0.73) for outdoor herds. Sows produced fewer litters, containing fewer piglets born alive than the year before. Rising rearing and finishing mortality meant pigs sold per sow declined even further (-0.84) to 21.57. The challenging weather conditions last year seem to have taken their toll.